Now, I don’t go along dusting/cleaning/disinfecting each individual item and then checking it off. I do a room at a time, or all of one thing at a time, before checking anything off. Example: Disinfect all the light switches in the house in a row. I made this spreadsheet a long time ago so I’d be sure to remember to do everything. Also, it feels awesome to check off the whole sheet. 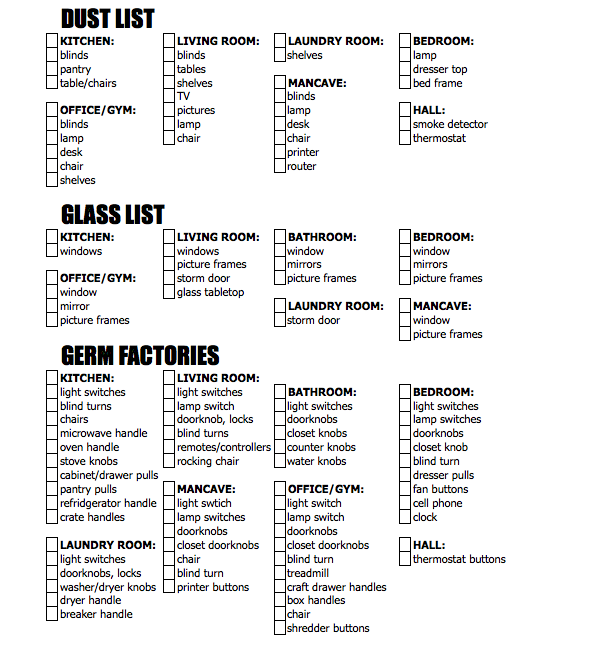 For the record, I do not dust all of those things, clean all of the glass, and disinfect everything on that list weekly. I tend to not even do it monthly. These three things are on my cleaning list at the bottom where I write when I last did it, and when I’ll next do it. It’s kind of a play-it-by-ear type of thing. Anything that needs done (example: the glass in our front door gets dirty easily and might get cleaned more often. This list is for the DEEP CLEAN. I decided what to add to the dusting list by what gets dusty, and the glass list by what is made of glass. The disinfect list is what gets touched. Some of the things, like the breaker handle in the laundry room, is almost never touched. I might decide that I don’t want to clean everything on the list and I don’t beat myself up about it if I don’t. Usually I check it off anyway or draw a minus sign through it to indicate that I did not do it and do not intend to. Lastly, I’ll say that I keep this list in a sheet protector in my main household binder (another post on that later) so I can use a dry erase marker and just erase easily when everything has been X’ed off. Do you use lists to remember everything you have to do? Or for the satisfaction of crossing things off when you’re finished? This entry was posted in Cleaning, Spreadsheet and tagged clean, cleaning, disinfecting, dusting, Excel, glass, list, spreadsheet. Bookmark the permalink.